My father has been cooking in Dutch ovens since the beginning of time. He has 45+ years under his belt as an active Boy Scout. I don’t think you could call him a Boy Scout “Leader,” he is more like one of the boys. Besides having the ability to do a headstand in a canoe while floating down a river, he can cook just about anything in a Dutch oven. In fact he cooks better in a Dutch oven than in my mother’s kitchen. He is proud of his culinary creations, and is always willing to whip up a little something special when there are hot coals around. Everything tastes better in a Dutch oven--- I am sorry, but it’s true. My father will stand by that statement until the day he dies. The secret he says, is that Dutch ovens are like a fine wine or a stinky cheese, they get better with time. The more you cook in your Dutch oven, the more flavor they will carry. More flavor equals better food. The Dutch ovens that my father hauls around are about 35 years old. They are cooked in continuously throughout the year, and they have never been washed--- with soap. These ovens provide 35 years worth of flavoring and the food is delicious! My father was always in our back yard starting fires to get the charcoals ready. In our family Dutch oven cooking was not used only for camping. It happened on a regular basis. My brothers and sisters and I loved it when Dad was cooking. We would huddle around the cobbler oven with spoons ready just waiting for the lid to come off. My neighbors may have thought we were a little strange. We didn’t care; we were eating good food. Dutch Ovens were developed in England and Holland in the eighteenth century. The basic design has remained unchanged for centuries, but the name has had many variations. The cooking techniques have also remained mostly unchanged. 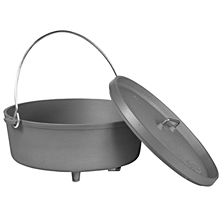 There is just something wonderful about cooking outdoors and the Dutch oven has proved itself time and again to be the perfect outdoor cooking tool. So pull out that Dutch oven—you know, the one lurking in the dark corner of your garage--- and enjoy the beautiful summer months cooking outdoors. Dutch oven cooking is a wonderful way to cook as a family. It’s something that everyone can participate in; you don’t have to be a Boy Scout. And who doesn’t enjoy a little cowboy cuisine every now and then?